This program provides currently certified New Jersey teachers, in any subject area, an endorsement to teach mathematics K-12 and earn a Master of Science in Teaching and Learning with Mathematics K-12 Subject Matter Specialization through a combination of NJCTL Online Courses for Teachers, Online Field Experience Courses, Online MSTL Courses (CSU-Global partnership) and Praxis examinations. Upon successfully completing these Online Courses and passing the Mathematics Content Knowledge (5161) Praxis, the candidate can apply to the New Jersey Department of Education for an endorsement to teach Mathematics K-12. These graduate level classes taken with NJCTL must be transferred onto a CSU-Global graduate transcript (restrictions and fees apply). 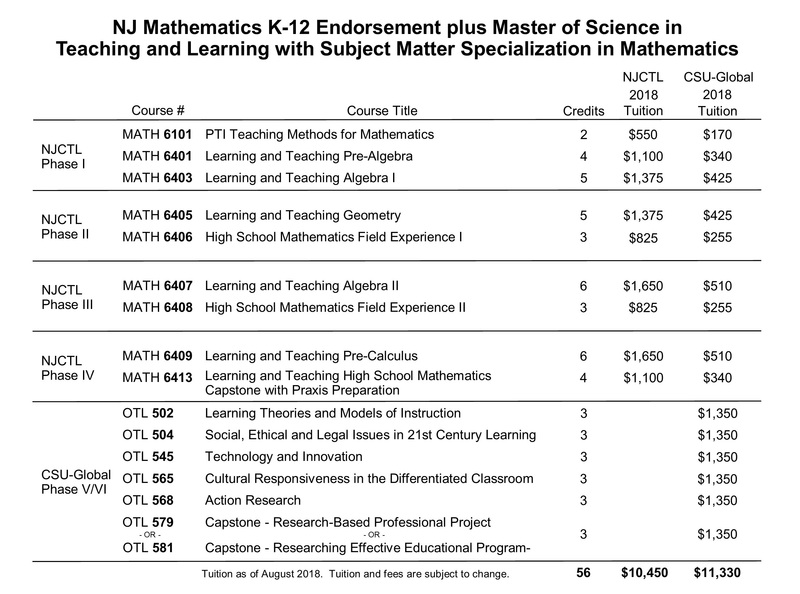 Click here for the NJCTL Mathematics K-12 Endorsement Program without MSTL.